This article by Jamie Brown make for interesting reading. From Byron Gourmet Pies and our customers point of view it highlights the benefits of grass fed beef and omega three friendly fats. The percentage of Omega three friendly fats we consume in our typical western diet is outnumbered 15:1 by less healthy, Omega six fats and yet humans have evolved over time by eating a balanced diet, says director of the Centre for Organics Research, Dr Carlo Leifert. Speaking last Friday at the Southern Cross University Coffs Harbour campus, Dr Leifert, who oversees the centre – jointly funded by the university and Department of Primary Industries – said a 1:1 ratio of Omega 6 to Omega 3 could be achieved by feeding beef and dairy livestock on a diversity of grasses, rather than corn-based silage. Corn oil has a ratio of 46:1, not as Omega 6 rich as sunflower oil but similar to soybean and cottonseed oil. Meanwhile, butter, lard, olive oil and even palm oil, are best when it comes to higher levels of Omega 3s. Marbling in beef also contains higher healthy fat levels when grown out on diverse pasture. 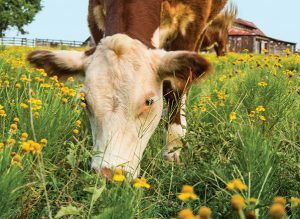 Dr Leifert said an exhaustive study of published papers statistically showed organic livestock produced higher levels of human-friendly Omega 3s when presented with different varieties of grasses. The triggers contributing to this difference involve a range of root architecture and their associated microbiology. Conventionally grown grass-fed cows, with 70 to 80 per cent of their diet based on grass, or grass silage, not corn silage, hay and grain concentrates, produced very similar amounts of Omega 3 fats as compared to organic production. But cows fed on grain and corn silage did not. In addition organic production – through diverse pasture – revealed higher levels of conjugated linoleic acid or CLA along with vitamin E. In fact, studies in the US where vitamin E supplements are banned in organic production showed those cows had more of it on board than conventionally reared animals. Breeding also made a difference to the organic production system, with a Swiss study showing traditional Braunvieh had nearly twice the levels of Omega 3 compared to the US Brown Swiss, which was selected for yield among other attributes. “It is clear the US lineage of Brown Swiss no longer has the capacity to convert pasture to useful Omega 3,” Dr Leifert said. While the demand from the consumer for organic products looks bright moving forward, the likelihood of producers risking the switch from conventional production is low, given the average age of a farmer is over 60 in the western world. ”We don’t take risks at that age,” warned Dr Leifert. The trend in selling organic produce is on the up, with the sector now worth $2.4 billion, having grown by 88 per cent since 2012, according to a report released last May. The global organic market has seen a 10 per cent year-on-year rise, now reaching a value of US$89.7 billion. The retail domestic market is now worth an estimated AU$700 million. Meanwhile demand grows with 40 per cent of consumers buying more organically produced product in the last 12 months and 60 per cent of Australian households now allocating food dollars to organics every year. Doorstep Organics, a pioneer in direct organics sales, grew 20 to 30 per cent annually for years on end, according to founders Geoff Richards and Carolyn Savage, who have retired to the Bellinger Valley. Organics agronomist Marc Percival, Agrisense,at Raleigh on the Mid North Coast, said there were exciting opportunities for diverse sub tropical pasture on the North Coast, which is dominated by fragile Kikuyu dependent on fertiliser which tends to lock-up in areas of red volcanic soil. He recommended heritage varieties of chicory, plantain, panics and legumes which offer better resilience than kikuyu. While the opportunity existed, he said certified organic seed of those important varieties, was limited at the moment. Supplying that could be an opportunity. he suggested.